The actress Lee Parry was born as Mathilde Benz in Munich. She already gained a foothold in the film business at a very young age. Her first movies came into being in the 1910's where she took part in movies like "Sünden der Eltern" (19) and "Nonne und Tänzerin" (19). 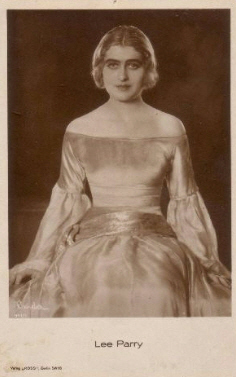 In the 20's she managed the rise to a star with movies like "Tanz auf dem Vulkan" (20), "Sträflingsketten" (20), "Der Roman einer armen Sünderin" (22), "Monna Vanna" (22) and "Die leichte Isabell" (27). With the end of the silent movie era her career also drew to a close. She played in the movies "Die lustigen Weiber von Wien" (31), "Keinen Tag ohne dich" (33) "Das Einmaleins der Liebe" (35) and "Adieu Vienne" (39) in the 30's, after that she retired from the film business. Besides her film career she was also a well-known singer who made many disc recordings. When she went to South America in the 50's she continued there here theater career. Lee Parry was married with director Richard Eichberg and with theater director Siegmund Breslauer.